Harry David Brecheen (October 14, 1914 – January 17, 2004), nicknamed "The Cat", was an American left-handed pitcher in Major League Baseball who played most of his career for the St. Louis Cardinals. In the late 1940s he was among the team's stars, becoming the first left-hander ever to win three games in a single World Series in 1946 and later leading the National League in several categories in 1948. His career World Series earned run average of 0.83 was a major league record from 1946 to 1976. From 1951 to 1971 he held the Cardinals franchise record for career strikeouts by a left-hander, and he also retired with the fourth-highest fielding percentage among pitchers (.983), then the top mark among left-handers. Born in Broken Bow, Oklahoma and nicknamed for his fielding ability, he was acquired by the Cardinals in 1938 after two minor league seasons, but did not get a chance to start for the team until 1943. He was nicknamed "The Cat" because of his ability to cover bunts. He appeared in three innings in 1940. Exempted from military service during World War II with a 4-F classification due to a spinal malformation and a boyhood ankle injury, he pitched in the 1943 and 1944 World Series. In 1943, Breechen pitched in 29 games, starting 13 of them. He went 9-6 with a 2.29 earned run average in 135 innings pitched. The next season he went 16-5. He won game four of the 1944 World Series against the St. Louis Browns. He was key to the Cardinals' upset win over the Boston Red Sox in the 1946 World Series. He won three games during the series. He recorded his finest season in 1948, posting a win-loss record of 20–7 with 21 complete games and led the league in earned run average (2.24), strikeouts (149) and shutouts (7). A two-time All-Star, his overall career record was 133 wins and 92 losses, with 901 strikeouts. After breaking Bill Sherdel's club record for career strikeouts by a left-hander in 1951, he held the mark until Steve Carlton surpassed it in 1971. His 25 career shutouts remain the Cardinal record for left-handers. His career World Series ERA of 0.83 stood as the record (with at least 25 innings) until Jack Billingham broke it in 1976 with a mark of 0.36. 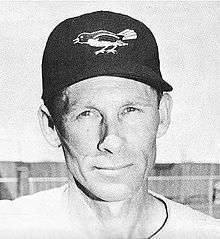 Playing his entire career for St. Louis teams, Brecheen ended his career in 1953 as a playing coach with the St. Louis Browns; it was that team's final season in the city before their move to Baltimore. He won his only start of the 1944 Series, which matched the city's two teams. During his career, he had a 133-92 win-loss record with a 2.92 earned run average. Brecheen's screwball was ranked the eighth-best of all time by Bill James and Rob Neyer. Following his playing career, Brecheen remained with the Browns when they became the Baltimore Orioles, and was their pitching coach from 1954 to 1967. He was voted into the Oklahoma Sports Hall of Fame in 1997. He died at age 89 in a nursing facility in Bethany, Oklahoma. 1 2 3 4 5 6 "HARRY BRECHEEN; WON 3 GAMES IN 1946 SERIES AGAINST SOX". The Boston Globe. Associated Press. January 19, 2004. Retrieved 3 April 2014. ↑ James, Bill; Neyer, Rob (2004-06-15). The Neyer/James Guide to Pitchers: An Historical Compendium of Pitching, Pitchers, and Pitches. Simon and Schuster. p. 52. ISBN 9780743261586. Retrieved 3 October 2012.